"Klikatelle" bagatelle game with case made of phenol formaldehyde, with provisional patent number 29395/33 on back, in original box and made in England 1920-1940. Thermos Flask with fluted cylindrical body and stopper made of dark brown phenol formaldehyde, by Thermos (1925) Limited, London, 1925-1940. Marked with: PAT.NO 327838 NO 24 JUG. 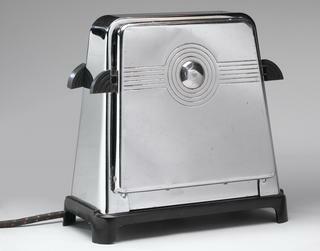 Dewald valve with radio case moulding made of dark brown phenolic, c.1935. Front inscribed "DEWALD". Electric alarm clock made of phenol formaldehyde, with round face, outer casing brown with a white circular surround on the face of the clock.Standing on a base it has a rectangular knob on top which can be depressed.Made by Ferranti c1930. Phenol formaldehyde (Bakelite) cigarette box, rectangular, with chrome steel lid. Base made of imitation walnut (brown/black) phenolic. Stepped vertical design at corners (Art Deco). 1920s-1930s. Made by Frank Godden Ltd, London, England. Base inscribed with "F.G.PHILABOX/FRANK GODDEN LTD/ 359 STRAND, LONDON/F.G.SERIES NO.15"; black print on gold ground. Box of imitation amber catalin, body is a semi-circular, fluted tube, flat lid with octagonal handle, rectangular ends forming legs, English, unsigned, 1930-1939. Philco mains radio receiver in phenolic plastic case. 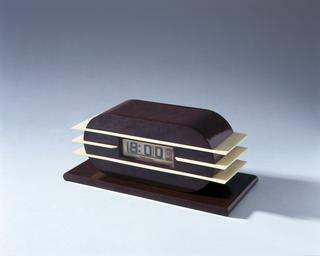 Rectangular shaped phenol formaldehyde(Bakelite) clock, with imitation walnut case (brown/black). Rectangular face gold with silver steel fittings, angular square design. Art deco influence. 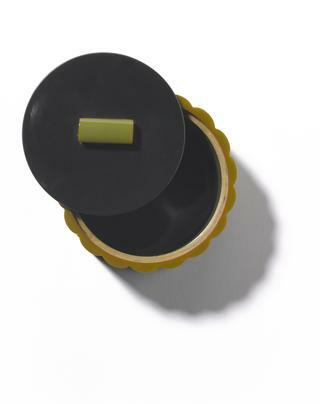 Case with moulded ridged decorations, slightly curved. Made in France, 1930s. Face inscribed "MADE IN FRANCE". Lamp standard made of phenol formaldehyde, with grooved vertical support attached to a circular steel plate underneath the phenolic base, which has"A GLENCO PRODUCT" and "MADE IN ENGLAND" stamped on it. Two carpet clips, bodies made of phenol formaldehyde with steel attachments, with"THE FUTURIST CARPET CLIP", Rgd DESIGN No 79615 on the back, made by W.A.H. Ltd., 1920-1940. Aluminium tray with corners and handles made of phenol formadehyde with a wooden backed base with a print of Nice showing "le Palais de la Jetee" with " LES BELLES EDITIONS FRANCE" (year obscured) superimposed on the etched aluminium face of the tray, 1920-1940. Square phenol formaldehyde (Bakelite) clock in imitation walnut (Brown/black). Stepped base, Art Deco design. Face has black characters on silver ground, with gold centre. Smaller circular alarm face above hands (under "12"). Printed at face base "FOREIGN". 1930s. Bowl made of dark brown/black/light brown phenol formaldehyde. Base has raised ridged edge. Rim decorated with silver overlay, consisting of plain band above a latticed edge. Made c. 1930. Polished.